Pruning for Betty. 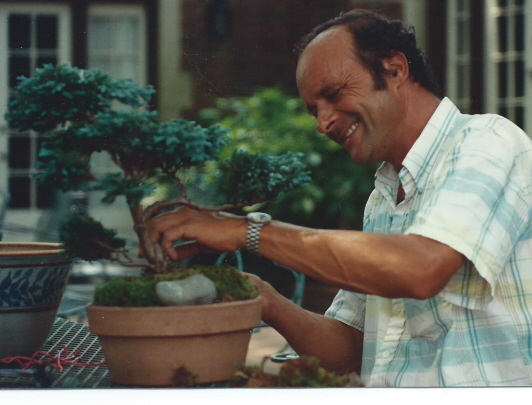 Japanese Maples, Topiaries and Bonsai – Johntheplantman's stories, musings, and gardening. 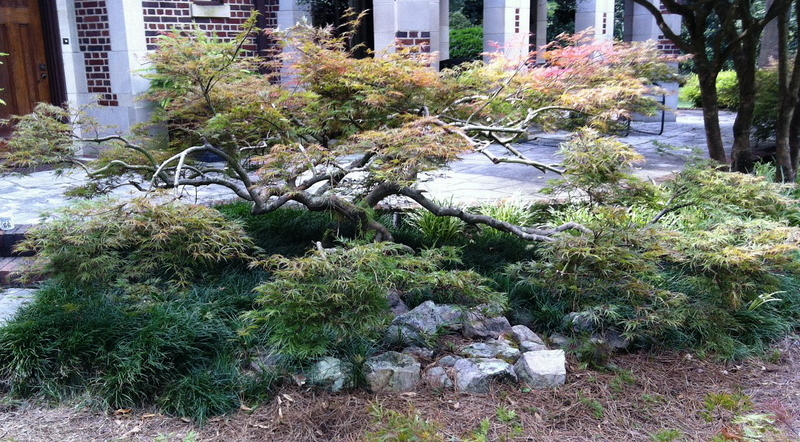 I got a text message the other day saying that the Japanese maples needed pruning. I had been expecting this so I shifted my schedule around, sharpened my Felco pruning shears, grabbed my camera and headed out. 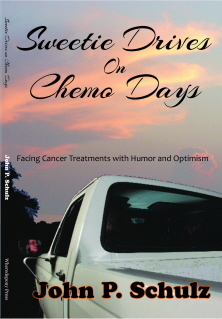 Betty has been a special friend and client for a number of years. She has also been a landscaping mentor, teaching me to adhere to rather high standards of design, installation, and maintenance. 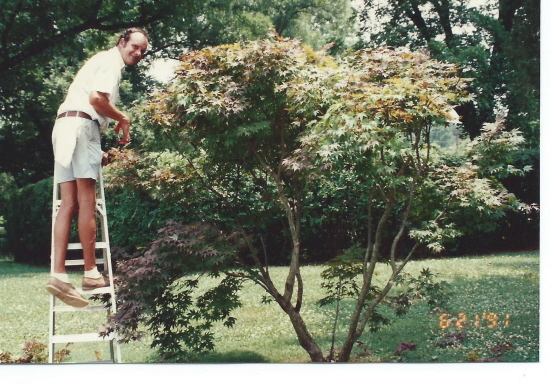 I have been pruning her collection of Japanese maples for years—she must have twenty or more of them—and to my knowledge, no one but me has ever pruned any of them. I had decided to do an article comprised of before and after pictures of the maples but things changed. Anyway, here is one of the before pictures. I worked on opening up the plant to show the lovely trunk and to allow light inside. 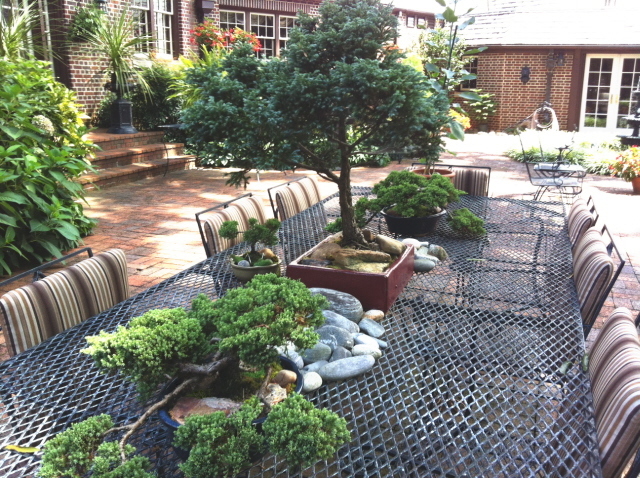 When I got in there I found the rock work and mondo grass that we had planted years ago when the tree was small. 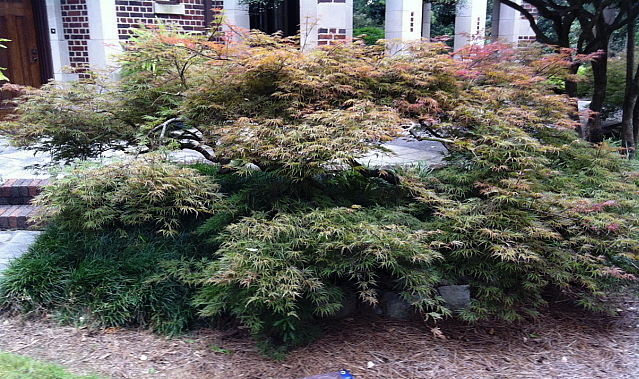 I’m not a purist, so if I’m wrong, tell me, but I think there are two main classes of Japanese maples—dissectum and palmatum. 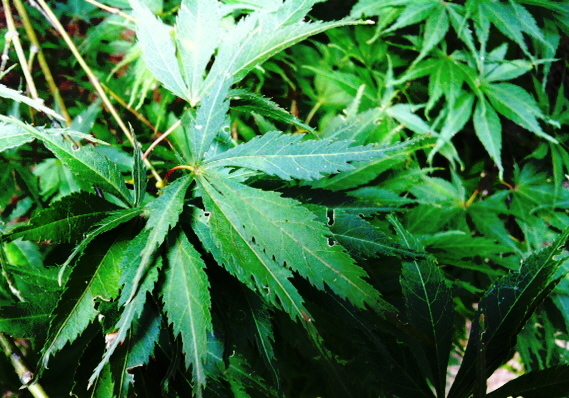 They are named for the shape of their leaves. Here is the leaf pattern of the dissectum. 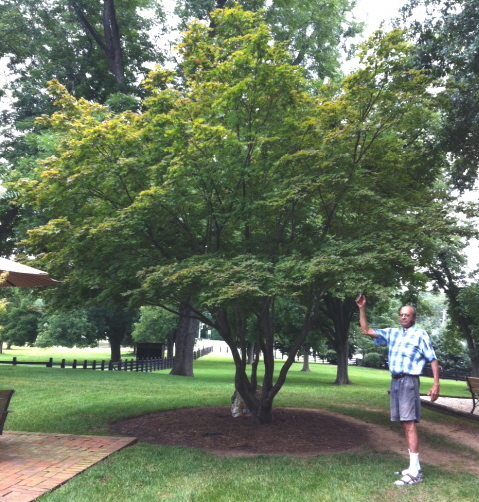 Pictured below is a palmatum maple that was pruned for years to encourage shape in the “finished tree. I’m not going to prune this tree any more unless it is to remove some sucker growth from the bottom or to remove a few low hanging pieces that might develop. The Boulevard bonsai is the tall one in the center. 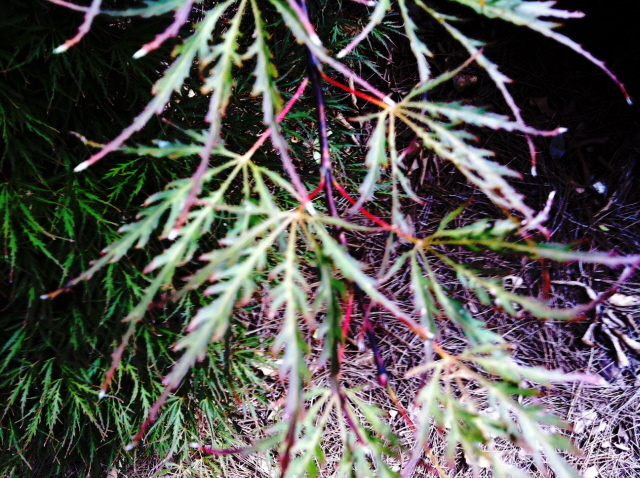 There are a lot of plants in this yard that are remarkable. I will include a couple that I enjoy. 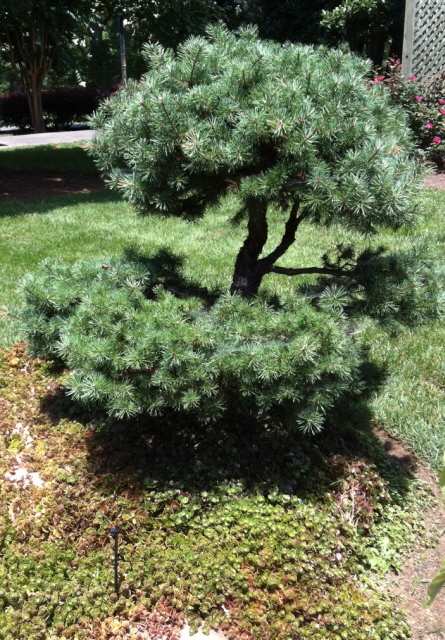 The first is a Japanese black pine that I have been pruning for probably ten years. This small garden shows off with a ground cover of a running sedum that I like quite a bit. It is bordered with nice rocks that hardly show any more. The plant below is called a Torulosa juniper or a Hollywood juniper. Its natural growth is sort of helter skelter and wild. We had this plant in a large urn for years and then decided to move it to the yard. 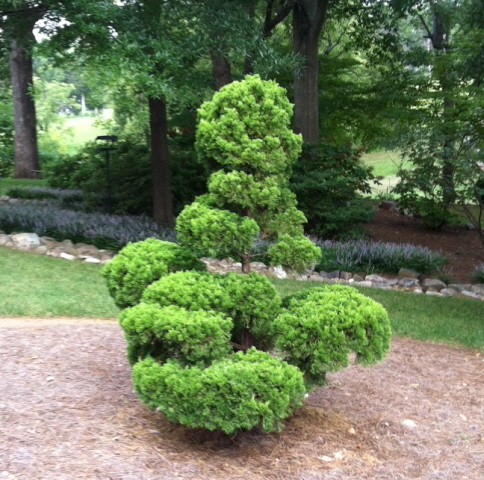 Hollywood Juniper or “torulosa” juniper pruned to topiary. Enjoyed the pruning tour around this garden. Pingback: What Happened to My Pretty Christmas Plant? | Johntheplantman's stories, musings, and gardening. Pingback: Before and After—Revisiting the Sites of Articles Past | Johntheplantman's stories, musings, and gardening. Not sure how I came to your blog, but I’m enjoying it. This fall, once they lose their leaves, I’m putting 9 in the ground and can’t wait. Through a long story, these particular trees have proved able to handle fun, unmitigated, southern MD sun. Did you forget about Japonicum and Shirasawanum types, BTW?